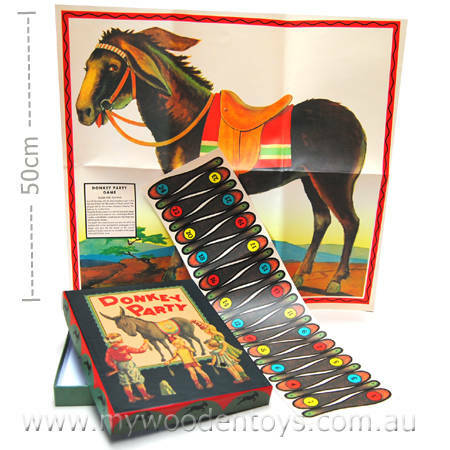 Pin The Tail On The Donkey is a traditional party game which has been recreated here and presented in a beautiful box copied from a 1930's version. This simple set contains a large poster of a tail-less donkey and twenty numbered tails which need to be cut out. The rules are simple and included on the back of the box. Each blindfolded player tries to pin the tail as close as they can to the right spot. The winner is the one who gets closest. For older children this game can be played with pins and the donkey hung up. (Pins are not included.) For the younger ones it can be played on a flat surface and the tails placed on the image. Material: Heavy duty cardboard. Thick paper donkey poster and tails. We like this because: "Lovely inexpensive retro set."